Veličina ovog PNG prikaza ove SVG datoteke: 800 × 457 piksela. Ostale razlučivosti: 320 × 183 piksela | 640 × 366 piksela | 1.024 × 585 piksela | 1.280 × 731 piksela | 980 × 560 piksela. sadašnja 16:23, 13. veljače 2019. 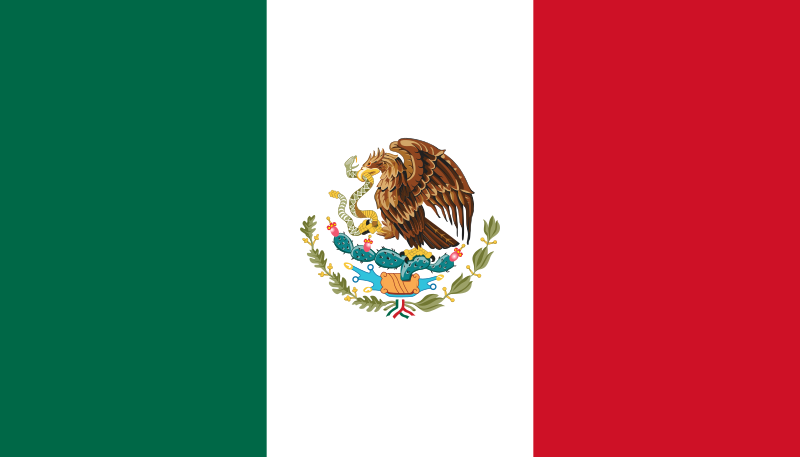 980 × 560 (157 KB) FDRMRZUSA Corrected coat of arms centering and proportion in relation to related flag width: 1/4 (width), according to official flag construction sheet: "File:Mexico flag construction sheet.svg". Now perfectly symmetrical in relation to related reverse: "File:Flag of Mexico (reverse).svg". Optimized: reduced svg code. No other changes. 17:31, 9. veljače 2019. 980 × 560 (161 KB) FDRMRZUSA Higher svg resolution from same file (latest version): resized by "Inkscape". Optimized: reduced svg code. No other changes. 14:24, 1. rujna 2016. 1.024 × 585 (313 KB) Illegitimate Barrister aligned coat of arms to perfectly dead-center. 07:03, 24. kolovoza 2010. 1.400 × 800 (414 KB) Zscout370 http://en.wikipedia.org/wiki/Talk:Flag_of_Mexico#Vertical_stripes said it was not even...It was. Svjetsko prvenstvo u nogometu - Meksiko 1970. Svjetsko prvenstvo u nogometu - Meksiko 1986.